You know you are a real geek when the highlight of your weekend is upgrading your WordPress software to the latest release… But in my defense, I’ve procrastinated this just because I was flippin’ scared to do it. And on top of that, I figured, so what if it is out-of-date as long as it works, right? Probably my biggest complaint about blogging is the writing itself. I don’t mean the ideas – I have plenty of those. But it always seemed in the past that I would have a great idea for a post, but no way to actually write it because my laptop was not at hand, or I wasn’t near a hotspot, didn’t want to go through the trouble of logging on, etc. I have repeatedly commented to those around me that I would blog more IF I could just do it from my phone. I tried to set it up with my old Nokia e61i, but never got it to work. 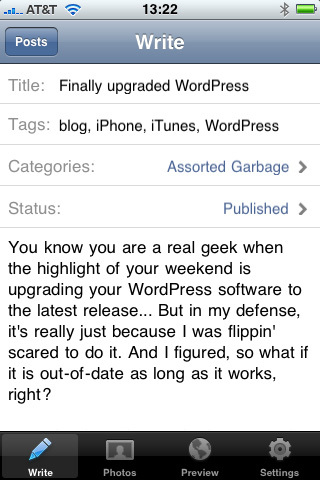 That’s why I was delighted to find a WordPress app on the App Store. Of course, after I downloaded it, I realized that I was in trouble. The version of WP that I was running was not supported. Argh… So I bit the bullet, and nervously read through the instructions for upgrading. Is it just me, or do you get nervous when the first three paragraphs of instructions are all about backing up and how a failure to do so could leave you without a working blog, unable to login, and generally cause the fall of democracy… OK, it was exactly that dire, but I was nervous none the less. So, now I can successfully write/edit from my iPhone – FTW! And hopefully that will mean more frequent updates here… but I guess time will tell… :-) Cheers! Actually, just this weekend I finally upgraded my WordPress too for the exact same reasons you cited. Also a friend pointed out that he could not click on the comment page while using IE7 because it would show an error message. Looks like everything is running well for you! « Adobe Creative Suite 4 – coming soon!